Note by CK1: As stated below, this tool is no longer in development. Nefarious's SCPToolkit is a continuation of Scarlet.Crush's original Xinput Wrapper (which this was also based on) and includes significantly improved functionality with DS3 and DS4 controllers than what you get here. You can still download this if you want, but I highly recommend using SCPToolkit instead. Hello guys, I am new here but I want to share a tool I made for Dualshock 4 controllers. I was inspired by the tool made by Scarlet.Crush for DS3. My tool works in a similar fashion and is based on source code from DS3 Scp Tool. I am no longer actively developing this, so check other forks of this for newer versions. It works though without messing with the original drivers for DS4. Uses HID Protocol to XInput mapping. 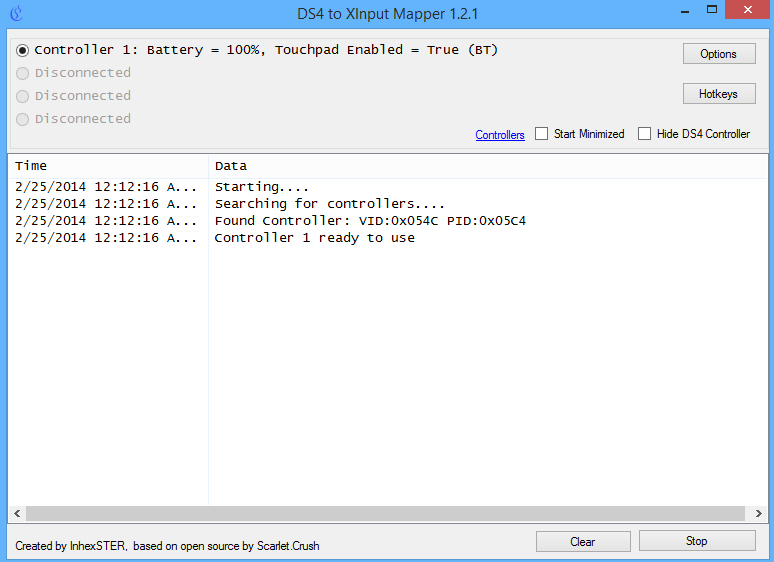 You still need to install drivers for SCP virtual bus device and possibly X360 Controller drivers. The whole project is in beta so please keep in mind there will be some bugs. 2. Visual C 2010/2012 Runtime. 4. Latest Official Microsoft Xbox 360 Controller Drivers available. 5. Minimum of Bluetooth 2.1 + EDR Dongle (if using Bluetooth). 6. Administrator rights on your PC. IF XinputTest shows everything correctly the problem is with the game! The Dark Souls is quite buggy port from consoles. So don't expect it to work flawlessly. I am 100% positive that everything works if you do everything correctly. People asking about Dark Souls will be ignored or will receive a wearing. There is a limited support of DirectInput in X360 Controller. No Vibration and triggers act different. Other option is to use of contoller without a tool and using in game settings to map buttons. Some games support it. Again no vibration as that's how DS4 DirectInput is defined. There is no plans to add virtual DirectInput device at the moment. As it would requite reverse engineering another controller and emulating it on the virtual bus driver. At the moment I am relying on Scarlet.Crush's code to emulate X360 and he definitely knows more about it. But he doesn't support emulating DirectInput devices in his tool as well. Input filter/wrapper applications are always very useful. I'm sure this will be most welcome, once more people have gotten their hands on the DS4. Thanks for the contribution. How are you finding the DS4?. Any apparent, non-PS4 specific improvements over the DS3? Such as the feel, the analog etc. I'm planning on getting one myself soon, for PC use. Definitely an improvement from DS3. Feels more firmly in hands and feels more solid compared to creaky old controller. Kinda feels solid on inside instead how DS3 was hollow. Triggers also better, one thing feels unusual is placement of Options and Share buttons which are equivalent to select/start. I'm glad this exists. Thanks for your work InhexSTER. Hopefully you'll be able to get rumble and the like working if you plan to go that far. One suggestion: can you bind the Xbox guide button to the PS button or the touch pad button? (11-09-2013, 08:44 PM)Trace Bullet Wrote: Thanks for making this! Great job mate! I'm a huge fan of the scarlet.crush drivers for using my Ds3 on my PC and have been waiting for someone to make something similar as soon as I heard the Ds4 getting PC support. I know this current version has no rumble support and I do play a game where I need that function. I was wondering if you had any plans to implement rumble support in the (Hopefully) near future? (11-10-2013, 08:54 PM)Grimnir Wrote: I was wondering if you had any plans to implement rumble support in the (Hopefully) near future? I was planning to invistigate that further, I have been able to read/write byte data to device but i need to find exact locations where rumble values are stored. The issue with that approach it would most likely require custom drivers for usb device same it was in DS3 and for bluetooth. (WinUsb drivers). Official drivers for windows don't list controller as Force Feedback capable. I specifically registered to reply to say that I love you, InhexSTER. Current time: 04-26-2019, 04:55 PM Powered By MyBB, © 2002-2019 MyBB Group.